A brand-new commercial Falcon 9 rocket designed to haul cargoto the International Space Station is still set to make its debut launch thismonth, despite delays in receiving final approval of its emergency destructsystem in case it strays off course, the booster's makers said. Falcon 9 rocket-builder Space Exploration Technologies(SpaceX) of Hawthorne, Calif., said it continues to aim for the first flighttest of its Falcon9 rocket from the company's dedicated launch pad in Cape Canaveral, Fla.,by the end of May. The firm already has a contract with NASA to use the Falcon9 rocket to launch its unmanned Dragon capsule on cargo runs to the spacestation. 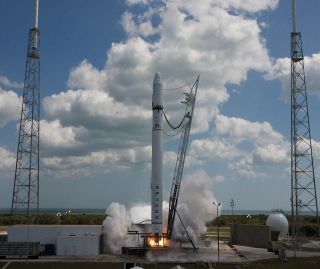 Officials at Florida's Patrick Air Force Base, whichcontrols the range at the Cape Canaveral Air Station, told SPACE.com that thecurrent target date for the Falcon9's first launch is now May 23. An earlier target of May 8 did not materialize. SpaceX officials, however, have repeatedly said they havebeen aiming for a wide window between March through May, and haven't yet pinneddown a specific launch date. "The test flights of Falcon 9 are very different fromthe future operational flights in their predictability, plus this is the firsttime we are launching from the Cape and the launch site itself is new,"SpaceX CEO Elon Musk told SPACE.com. Thus, the firm isn't setting its sights too high for thisfirst attempt to lift off the 178-foot (54-meter) tall Falcon 9 rocket, whichwill carry a mockup of the gumdrop-shaped Dragoncapsule. "Falcon 9 will do a flight countdown attempt as soon aspossible," Musk said in an e-mail. "Please note that I do not say'launch,' as there is a good chance of seeing an anomaly (vehicle or groundside) on the first flight countdown that we have to investigate." SpaceX says range availability and certification of its flighttermination system are the two main factors driving the schedule at this point. Before SpaceX can launch the Falcon 9, the company mustcomplete testing of the Falcon 9's termination system, which is a safeguard designedto destroy the rocket in an emergency by splitting the vehicle's fuel andliquid oxygen tanks. "If I knew exactly when that would end, I could tellyou when we would attempt a flight countdown," Musk said. The first Falcon 9 must also wait its turn between theplanned May 14 launch of the spaceshuttle Atlantis from the nearby Kennedy Space Center, and a mid-Mayunmanned Delta 4 rocket flight from Cape Canaveral Air Force Station. If all goes well with the first launch, SpaceX plans tobegin carrying out its cargo-delivery contact with NASA on the Falcon 9'ssecond launch. The company hopes to eventually certify Dragon to loftastronauts and paying customers to orbit as well. In March, SpaceXtest fired a cluster of nine engines that make up Falcon 9's first stage. Theso-called "static-fire" test went smoothly on the second try, after afirst attempt was aborted because of a technical glitch.